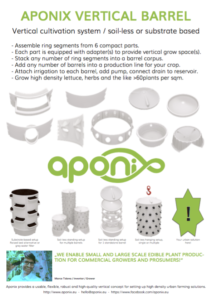 The aponix vertical barrel concept provides building blocks to be able to set up various solutions for vertical plant production ideal for urban farming operations where flexible verticality and at the same time professional usage is critical. It can be assembled into soil-less large operations with central fertilizer reservoirs, single standalone soil-less columns but also into a soil or medium based raised bed alternatives or even water filters for smart sustainable urban areas. 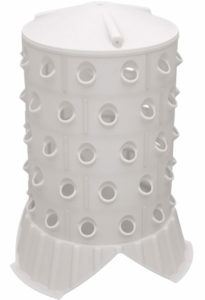 Standing barrel using two 2-inch net pot parts. The number of the ring segments stacked – height and total number of grow spaces – are variable. Easy to assemble, consisting of a few simple parts – a) the 1/6 part of a full circumfence/ring element of the barrel providing different plant adapters, b) the top and bottom lid and c) if you are using the standing version a bottom stand lid combination. You can easily assemble a full ring segment of 6 1/6 parts providing 12 single standard 2″ netpot grows paces each requiring 15cm of vertical space. Other adapters for larger plant sizes will be available in 2017. You can stack as many of the ring segments as you have vertical space available adding grow spaces for each ring segment. This translates flat growing area in urban farming circumstances to a maximized growing area now on the surface of all your vertical barrels in your growing setup. It is made of durable, high quality plastics, PVC/ASA that can be manufactured also with certified food-grade thermoplastics. Easy to disassemble for leafy greens production only during the warmer growing season depending on your location. Easy cleaning using a power washer or steam cleaner after each growing cycle: Harvest, unstack, power wash, restack, replant. Easy to ship worldwide due to small, well stackable compact parts. Optional custom coloring of the segments to fit you corporate identity. Irrigation can be realized using either our selection of a) a pressure spray nozzle (Aeroponics) or b) using a sprinkler unit that can be run with less pressure (vertical NFT). Either way it can be used with any liquid being mineral fertilizer (hydroponics) or organic fertilizer (aquaponics). Hanging and standing versions possible. A standard 2″ (5cm) net pot. Distance between grow spaces. Diameter of a hole is exactly 5cm. 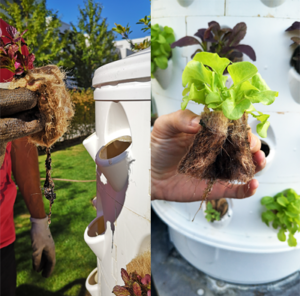 As grow space in the soil-less parts you have the option for two 2” net pot (diameter 5cm or 2 inches) or one centered 3″ net pot (diameter 7.5cm or 3 inches). As a growing medium to keep the inserted seedlings in its grow space as it grows, we recommend growgrips, simple filter foam or rockwool cubes or rockwool shreds. You can insert seedlings which already have a small root and first leaves (same like in other systems like NFT). Netpots can be purchased in bulk. Testing to get rid of the standard plastic rock wool seedling combo. Here we are just using a foldable jute substrate. 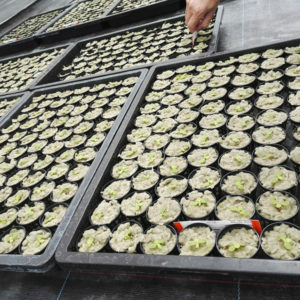 Seedlings have been growing in standard soil. There are many sustainable alternatives! The vertical barrel is suitable to grow small vegetable crops, herbs, lettuce and even strawberries. 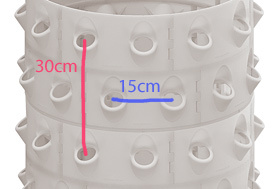 Each grow space provides a vertical space of 30cm and 15cm horizontally for fruits and leaves using the two 2″ parts. The idea behind the barrel concept is, that it provides a flexible irrigation corpus for grow spaces. We have tested 3 irrigation options that can be delivered – spray nozzle, inverted sprinkler or our water buffer part. But you could well integrate and experiment with your own irrigation solution – like fogging. Depending on the selected pump, irrigation can be permanent or on intervals. According to the atmospheric conditions, the chosen intervals should ensure, that the plant roots and the medium used never starts to dry and get sufficient nutrients. Example: 15min spraying, 45min pause would be sufficient to avoid a permanently running pump. Lettuce seedlings in net pots filled with rock wool shreds. When they are large enough they are transplanted directly into the vertical barrels. You can select an appropriate pump as soon as you know the maximum number of barrels that need to be irrigated at once. Some examples on how the vertical barrel component can be integrated into a larger setup context.